If your AWS Lambda function is pretty much just running in front of some database, serving your users content that doesn't change too often (just like... live election results or webcomics! ), you might want to cache your function's responses. Caching can speed up response time (hey, your function doesn't have to run! ), reduce executions count (freeing up some that concurrency limit), free up some DynamoDB capacity units, monitoring events (wether it's Cloudwatch logs, X-Ray, Thundra, Dashbird or Honeycomb, Sentry... hell, here's a full blog post dedicated to serverless observalibility tools), etc, etc, etc... and, of course, reduce costs. Why a custom domain? First, vanity. Second, readability. Last, and definitely not least... stability. Really. Why? Because API Gateway URLs change when removing and redeploying service. And you don't want to be keeping manually track of that. I'll assume you use the Serverless framework. Why? Because it's the sane, sensible and free (as in free beer AND open source!) thing to do. If you don't, don't worry; it works the same. You'll just to work out how to do it through whatever it is you use, wether it's Terraform, SAM, Cloudformation (😨), aws-cli (😰), AWS's Console (😱) or something else. If you do not want to use a custom domain, you can skip this part and jump to Setup your microservice. Otherwise, keep reading! If you know what you're doing, just go ahead and jump into the Route 53 console. It's pretty straightforward and well explained anyways. If you have some trouble, the AWS documentation is pretty good here. Your subdomain already exists? Check out Migrating DNS Service for a Subdomain to Amazon Route 53... You're creating a new subdomain? Go have a look at Creating a Subdomain That Uses Amazon Route 53 as the DNS Service... For a whole domain, it's pretty much the same. See Making Amazon Route 53 the DNS Service for an Existing Domain for an existing domain or Registering Domain Names Using Amazon Route 53 if you're registering a new domain with Route 53. Ok, domain is done! Now, let's get ourselves an SSL certificate! What does ACM stand for you ask? AWS Certificate Manager. Or Amazon Web Services Certificate Manager. You asked for it. So head over to the certificate manager's console. Don't bother with the values. Since our subdomain is managed by Route 53, just hit "Create record in Route 53"
Once you've done that, click "Continue". Now we wait and refresh the page until the status goes from "Pending validation" to "Issued". It may take some time (~20 minutes). Also, keep that page open. We'll need it later. Next, let's setup the project. Open your terminal, go to your favorite stuffINeverPlannedToKeepAroundButAreStillHereTenYearsLater directory (for me it's either ~/Downloads or ~/Desktop) and set it up ! (for more info, check out the project's AWS Getting Started). Ok, you've got a nice hello world microservice waiting to be deployed. Let's setup our custom domain and caching using Cloudfront. First, install serverless-pseudo-parameters: `npm install --save-dev serverless-pseudo-parameter`. It makes both our lives easier. What did we just add? A Cloudfront distribution! Oh, you want to know what it is that you just copy-pasted? Of course you do. If you don't, you should. If you already know, props to you, go straight to Deploy! ViewerCertificate: it defines the certificates your cloudfront distribution will use for SSL. There are multiple possible values for the certificate type. In our case it's an AWS Certificate Manager certificate, so we use the ACMCertificateArn key, with our certificate's arn as the value. Since we use ACMCertificateArn we must also specify an SslSupportMethod (cf the AWS Documentation). Since we don't want to pay any additionnal fees, we'll specify sni-only. The other choice, vip, uses dedicated ip adresses. DefaultBehavior ! Here you specify which HTTP method are allowed (AllowedMethods) and will be cached (Cached Methods). They require specific sets of values and not every combination will be considered valid. TargetOriginId: We'll see this later. ViewerProtocolPolicy: We want to use https and redirect http requests to https, so we'll use redirect-to-https. There are other possible values. DefaultTTL: your cache duration in seconds. Here it's set to 365 days, but you can set it to 5 seconds. 0 disables it. Compress: self-explanatory. Save bandwith. Speed-up requests. Compress. Forwarded-Values: Oh, that's a fun one! Here you define which headers and QueryString parameters are forwarded to your origin (here your Lambda function). Keep in mind: any forwarded value is used in the cache-key. Not sure what that means? If you use a timestamp as a header, such as X-Amz-Date (used in Signature 4 signing), your requests won't be cached. Ever. Each time forwarded query string paramaters or header changes, it will be considered a new request and be forwarded to the origin. Enabled: well, it better be. PriceClass: I picked the cheapest one, PriceClass_100. There are other options, here's some help on how to pick one. Origins ! My favorite. That's where the magic happens. Where we define the TargetOriginId we saw just earlier. Where we tell Cloudfront who it'll cache! First the Id (which is the value you'll have to match in TargetOriginId). Can be whatever you want. Next, the Domain Name. Here I'll be doing some Cloudformation magic to join the function's API gateway id to API Gateway's domain. But if you want you could hard set your domain (bad idea in our context since API Gateway URLs change when removing and redeploying service). 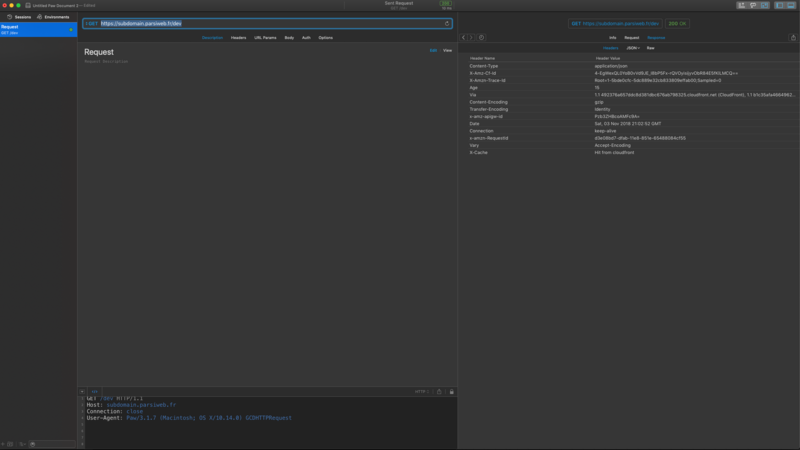 Finally, CustomOriginConfig. Just some http port settings and protocol settings; pretty self-explanatory too. Yeah, that's it. You'll need to be patient however. Cloudfront takes aaaaaages to deploy the first time (usually around 20 minutes). The wait is over? Great. Head back to Route53 on AWS console's. Use your favorite REST Api tool, wether it's Postman, Paw or curl. Set the request type to GET, use your.configured.domain.tld/dev as the url(the serverless framework deploys by default on the dev stage, hence the /dev path). Hit send, or enter, or whatever your favorite tools uses. It worked? Great. Of course it did. Now, go check the response headers, more specifically the X-Cache header. Done! Finally! In the end, it really just is the [Old Engineer and the Hammer](http://answers.google.com/answers/threadview?id=183998 ) story all over again (fun fact: the first time I heard this one, it was with a computer and an IBM guy). You can use this setup to "secure" and "force" API Gateway usage with Cloudfront, protecting your Lambdas, concurrency limits and... bank account (part 1 and part 2); more on this later. You can also use it to directly proxy Lambda through Cloudfront (but you'll lose caching capabilities, as far as I know. And I've tried). I'll also dive deeper into this one later on. I also have to warn you once more regarding the ForwardedValues property in the DefaultCacheBehavior settings. It can take both Headersand QueryStringparameters, and defines what will be forwarded to your origin (here, your Lambda function) instead of getting stripped away by Cloudfront. Pretty neat, right ? The thing is, every forwarded value is used as part of the cache-key, meaning that two nearly identical requests, for the same content, differing only by, say... their Authorizationor x-amz-dateheaders... will be treated as two different requests. The thing is, AWS Signature 4 relies on a date timestamp (which, by definition, changes all the time), so... even for the same user, if you use IAM as your API Gateway's authorizer, you won't be able to cache the requests. Also, things will work quite differently if you use Cloudfront in front of an IAM secured API Gateway enpoint. First of all, you'll need to sign your request, for your API Gateway endpoint. So the host in your canonical request will be blablasomethingwhatever.execute-api.your-region.amazonaws.com instead of somethingelse.cloudfront.net. Last but not least, you'll have to make sure all IAM signature headers (Authorization, x-amz-date, x-amz-security-token if you use Cognito Federated Identities, and host) are properly forwarded to your origin by Cloudfront. But Authorization, x-amz-date, x-amz-security-token can't be specifically forwarded. 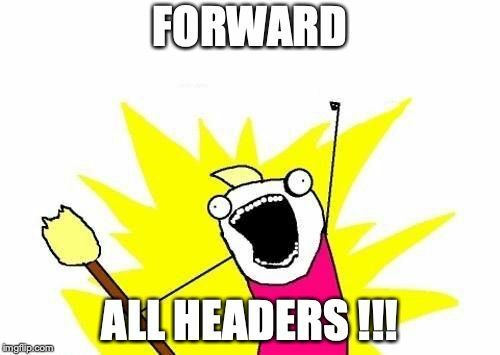 You'll have to forward all headers, which can be done by setting the forwarded headers to "*" in theForwardedValues Headers property of the DefaultCacheBehavior.